One year ago today, I spent half the night making delicious scones, woke up at 3 a.m., made a pot of tea and sat to watch the wedding of Prince William and Kate Middleton. The wedding brought back so many memories of the day in July 1981, when I, a nine-year-old little girl woke at 4 a.m. to watch the wedding of William’s parents, Prince Charles and Lady Diana Spencer. I was obsessed with Lady Diana from the moment I was “introduced” to her. Maybe it’s my Scottish heritage, but I’ve always had a soft spot for those British Royals. Back then, my dad used to wake up at 4 a.m. and he left for work at 4:30 a.m. Perfect! “Hey Dad, can you please wake me up before you leave so I can watch the royal wedding?” Let’s just say the answer was no. I woke up anyway, patiently waited in my room until he left and I quietly ran downstairs to find my mom, who usually went back to bed once my dad left for work, watching the wedding. Thankfully, my mom was more level-headed than my dad, (well, in this instance. She is the same woman who chased us around the house wielding a wooden spoon when we were bad) and she said I could stay and watch the wedding with her. I’m not sure how they contained their excitement, but my two sisters slept through the whole thing. 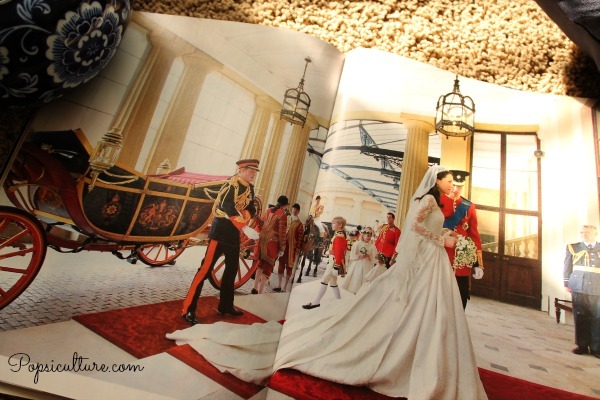 When Diana emerged from the glass coach, I thought her dress was amazing and the 25 foot train was to die for! I was going to have a wedding dress just like that when I grew up! I still think Diana’s dress was amazing. It may say “1981” more so than hearing “Bette Davis Eyes” on the radio, but it was big and bold and she was truly a princess. I watched the wedding in its entirety and by the time it was over, I had to get ready for school. We were on a track system (similar to year-round school) and on July 29th 1981, I had very important 4th grade “things” to do at school. By the time breakfast rolled around, I was falling asleep in my Captain Crunch, still watching the coverage on our nine inch black and white TV in the kitchen. Thanks to some Pepsi and pixie sticks (just kidding, I would never), I made it through the day, and the memory of watching that wedding with my mom is one I always treasure. William and Kate’s wedding was just as exciting to me. Of course, I couldn’t wait to see her dress. It was beautiful and I immediately thought of Grace Kelly’s wedding dress when I saw it. But, I will admit to being ever so slightly underwhelmed. I loved the dress, but still thought Kate would do something a little less “safe.” Especially once we found out it was a Sarah Burton for Alexander McQueen design, I then expected a little more edge. Regardless, there really isn’t anything negative to say about that dress. Her second dress, which she wore to the evening reception, was equally amazing. Kate’s style is impeccable, she’s not fussy and all of her clothes are accessible. Plus, she’s a bargain shopper after my own heart. She doesn’t wear a lot of accessories, but I thank her for introducing us to the fascinator, and I wish Americans would embrace this fashion accessory as the Brits have. The reality is waking up at the ungodly hour of 3 a.m. or 4 a.m. to watch a royal wedding may seem silly to some. But these are history making moments and we should embrace them. It’s fun to get caught up in the hoopla. But, thankfully for my daughter’s sake, technology now allows us to record such history making moments and I didn’t have to wake my then 3 year-old to watch the wedding. We watched it on “tape delay” once she woke up later that morning. And she still has my favorite quote from that day, “This wedding is royaltastic!” Yes it was!